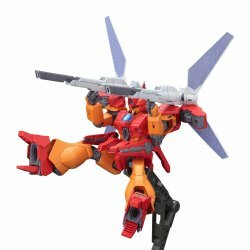 A new aircraft appearing in "Gundam Build Divers", Jegan plast master decided to kit! * Characteristic back armament is equipped with various gimmicks such as panel deployment, gun barrel expansion, grip deployment. * Beam cannons of shoulder and legs can be deployed. * Backpack is part replaceable, some HG 1/144 s..
* Backpack is part replaceable, some HG 1/144 series can also be equipped.